A Hacker handbook has always been a how-to manual for building confidence as a college writer. Diana Hacker conceived A Writer’s Reference as a quick-access innovation in handbook format, and Nancy Sommers continues to reinvent its content for an evolving course emphasizing critical reading and writing. For more than 25 years, the book has allowed students to build confidence and take ownership of their college writing experience. 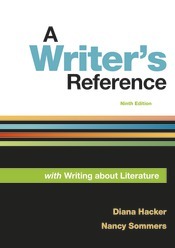 A Writer’s Reference, Ninth Edition, and LaunchPad for A Writer’s Reference together represent a next-level tool for college writers. What’s most exciting? An emphasis on help that is personal, practical, and digital. A Writer’s Reference is reimagined as a system that helps students target their needs and see their successes; that offers innovative practice with writing, reading, thinking, and research; and that lives in an engaging multimedia environment. Diagnostics, e-book tools, and custom options allow students and teachers to personalize the handbook. How-to pages, writing guides, student models, and exercises and activities deliver pragmatic, transferable lessons. And with a more interactive e-book, 24 new video tutorials for argument, analysis, research, and citation, and tools that make assigning and assessing a breeze, LaunchPad will be the digital solution that boosts your confidence as well as your students’. A Writer’s Reference, class tested by literally millions of college writers, still offers the right stuff.